The VAF is organizing a new session at the Durham, North Carolina conference (Saturday June 4, 2016), and we look forward to a lively shared conversation about research in the field. If interested in participating as a speaker, please submit a short paragraph (add pictures, if helpful) describing a proposed 5-8 minute talk. We especially encourage graduate students to share their dissertation projects. Participants in this session will be listed in the conference program. Contact Gretchen with any queries. 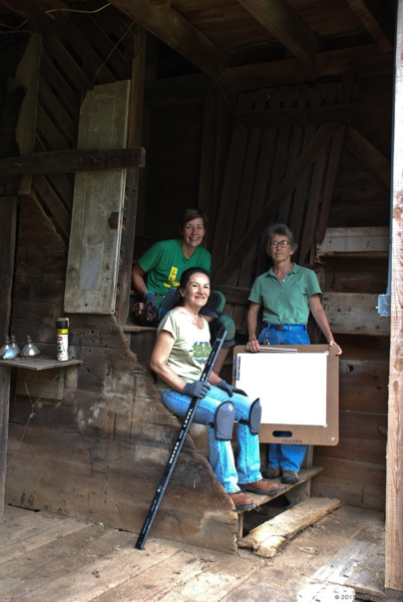 We latter-day “Friends of Friendless Farm Buildings” in Down Jersey, are recording Salem County farm outbuildings with the help of a $500 Orlando Ridout V Fellowship. This project continues work I started in anticipation of the 2014 VAF annual conference. 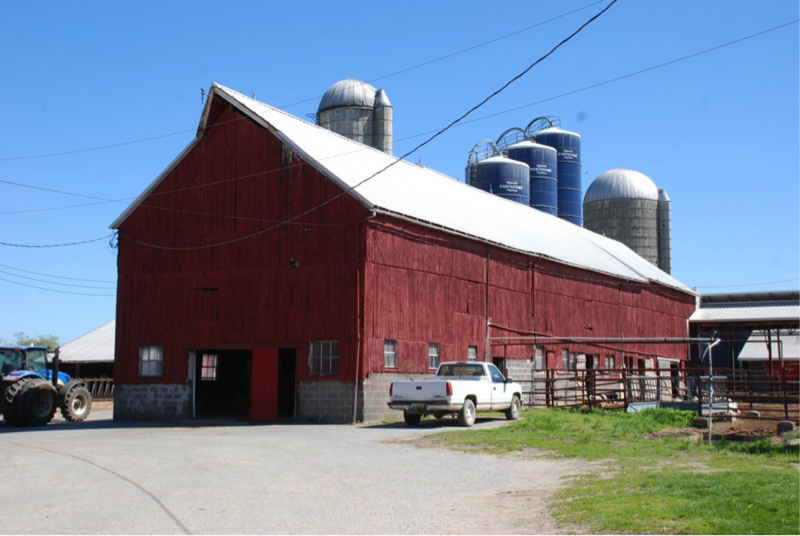 I’m trying to address the huge gap in our detailed understanding of farm buildings in southwestern New Jersey, which are rapidly disappearing despite aggressive efforts to preserve farm land. Attendees may remember the three farmsteads featured on the “Patterned Brick and Beyond” tour. That fieldwork uncovered two hewn-framed English barns that had been converted to dairy barns, and three kinds of crib barn/wagon houses. We began to learn the details of construction and how they functioned and changed over time in southern New Jersey, where no detailed recording of agricultural buildings had been done before. To see this survey, go to https://app.box.com/s/t31y2n1h43yweges8lbrft0ld0rkoqbf. Among the barns, we found two examples of the three-bay, English threshing ground barn, but also two examples of a two-bay animal barn, one pre-industrial, the other early 20th century. On the John and Charlotte Wistar farm (formerly known as Wyatt), these two barn types had been built end to end, and later were connected, extended, fitted with hay loaders, and finally, added to and converted for dairying purposes. On the Watson farm, the threshing barn was also extended, fitted with a hay loader, and given a straw shed addition, which was later converted to a milking parlor. An animal barn—for horses—was added in the early 20th century, when new dairying laws required cows and horses to be segregated. The alterations seen in these barns reflect well the ways in which southern New Jersey farmers responded to the expanding livestock market in the nineteenth century, and to twentieth-century government dairy regulations that required sanitary conditions for the production of milk, as Sally McMurry has discussed for nearby southeastern Pennsylvania (Buildings & Landscapes 20:2, 22-47). The other outbuilding we found was the multi-purpose gable-fronted wagon house or drive-in corn crib, which contains corn cribs, a drive-in or drive-through wagon bay, and sometimes a tightly closed loft for storing grain and a cellar for storing potatoes and fruit. True to Henry Glassie’s observation, New Jersey wagon houses are “located in a position of importance with the farmyard.” (“Eighteenth-Century Cultural Process in Delaware Valley Folk Building” Winterthur Portfolio, Vol. 7 (1972). Anxious to learn more, this year I landed another project grant from the New Jersey Historical Commission. 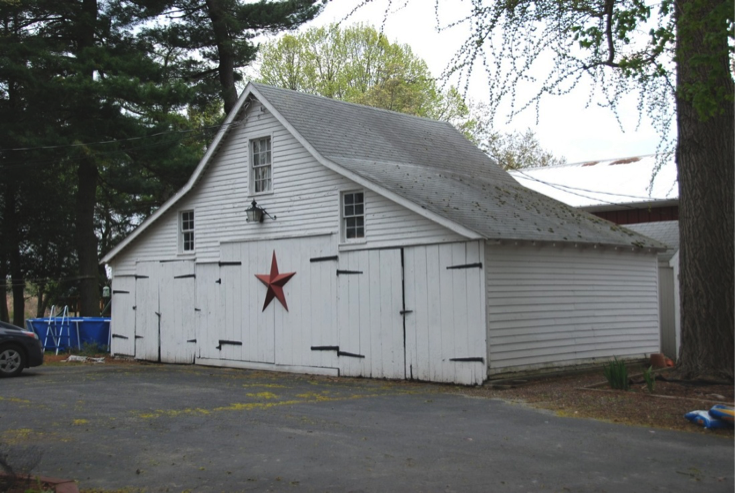 This time, we are recording five outbuildings on four properties—a long dairy barn, a small carriage barn, and three wagon houses. The Ridout grant is a welcome supplement to the funding, as the New Jersey grant amount is smaller than requested. So far, the buildings have all been measured. That fieldwork took place between August and November, aided by my intrepid measuring duo, Stephanie Fazen and Maria Moreno—veterans of my previous grant and 2014 VAF tour chase car drivers. Though the drafting, detailed photography, archival research, and narratives are yet to come, there are findings to report. In the Cadwallader long dairy barn (Figure 1), we found three, hewn-framed ground barns, each one a threshing barn, standing end-to-end, within the long dairy barn. 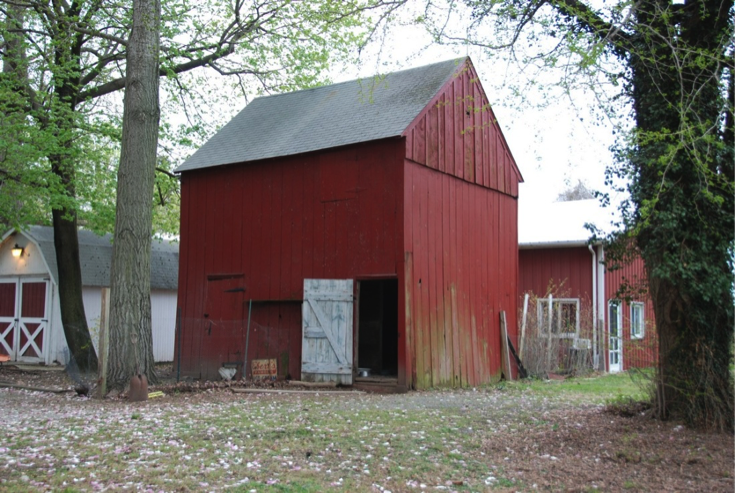 One barn was dated “1792” on an inscribed tie beam, one pre-dates 1840, and the other was added shortly thereafter in what appears to be an expanding antebellum operation. 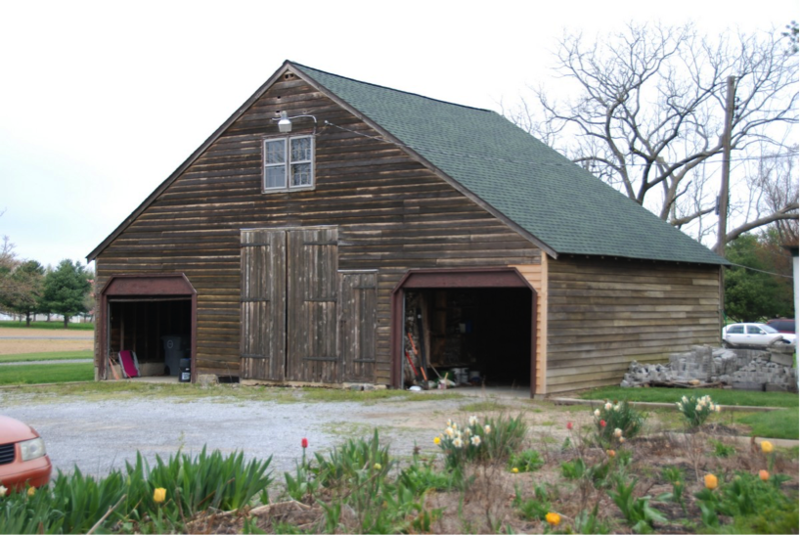 The oldest barn was originally one-story, then it was raised to match the height of the second, two-story barn. Besides its original shortness, it is also distinguished by having hewn braces and rafters, whereas in the others these pieces are sash-sawn—a rare, dated piece of cutting technology. In 1934, a new Quaker family from Pennsylvania moved in. In order to expand and upgrade for dairying, all three barns, standing as individuals, were connected together, fitted with a hay loader, and two were widened to meet the government regulation for accommodating a double rank of milking stalls, wood framed with metal stanchions. At this still active dairy farm, the progression of change has taken this barn mostly out of use as modern buildings now handle milking and stabling. Heifers still occupy the pens and veal calves occupied the old milking stalls for a time, but now only cobwebs and a large population of cats occupy the milking parlor. The Mulford farmstead has a wagon house(Figure 2) and a small carriage barn (Figure 3), both clad in board-and-batten siding and framed with sash-sawn timbers, so likely it was built before the Civil War. The wagon house was like no other I had seen, showing four different builds over a century. Beginning as a one-story building of unknown use, it grew upward to a one-and-a-half story granary with wagon bay, then grew deeper by six feet, and finally sprouted lateral shed additions, one containing a corn crib. The sheds have a shallower-sloped roof than the center section, giving the building the typical broken-slope roofline so often seen in area wagon houses. Two of three original grain bins survive in the loft—a most exciting find. Also intriguing was the discovery of an old shoe, perhaps a ritual concealment, within the wall. The square-plan, two-story carriage barn features a carriage bay, a horse stall with a manger, and a hay loft. Though the double-doors are replaced with a passage door, weathering on the frame and the door header seen in the loft bears evidence of them. It is now a chicken house. 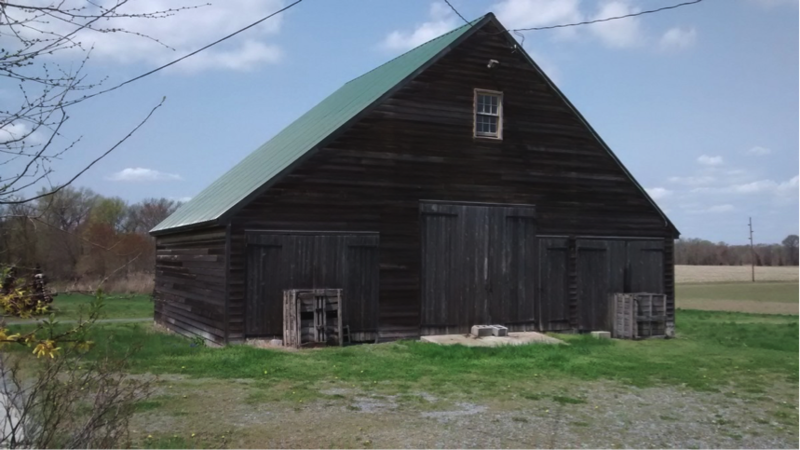 Lastly are two very similar wagon houses, named Zerns (Figure 4) and Thompson (Figure 5), that have the appearance of the Dutch-American barn of northern New Jersey and the Hudson Valley. Like the latter, they are gable-fronted with a large central bay with double-leaf wagon doors and smaller side-aisles. The roofline is straight, and they appear to have been built of a piece. But instead of Dutch anchor bent framing, we see English box frames. This building type was never the main barn—the place for threshing, animal quarters, and fodder storage. Both wagon houses are almost identical in design—a full cellar under the drive bay, a stone foundation, corn cribs built into the center bay, a broad, sturdy stair to the loft, and a close-fitting, unpainted, horizontal board wall finish in the loft—possible evidence of grain storage. I’ll submit a future VAN report upon completion. For questions or comments, please email me at jlsheridan@verizon.net. Thank you, VAF, for the kind help! Figure 6: The crew at Zerns. Stephanie Fazen, Maria Moreno, Janet Sheridan. I am writing a book about how a majority of middle-to-working class Americans achieved domestic improvement in the late 19th and early 20th century (1880-1940). I am seeking detailed case-studies of family histories in houses and apartments demonstrating the material conditions of pre- and post-domestic improvement reform. This would include details about acquisition (or lack) of public utilities, stoves and appliances, basic furniture, bedroom size and usage, etc. 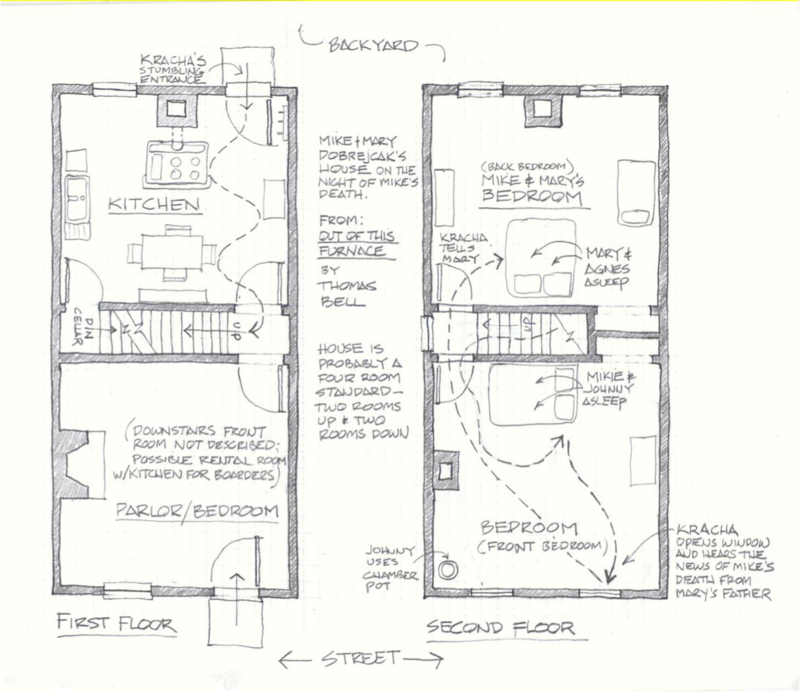 Although family history is an important component, I am primarily collecting case studies that allow me to construct measured plan drawings showing the location of utilities, furniture, as well as standard architectural elements like room shape, stairs, windows and doors. Since the type of buildings I study are rarely drawn in plan detail, I have typically relied on documentation within existing houses and from photographs, diaries, oral histories, archival records, etc., from houses that no longer exist. Ideally, I would record the domestic transition of a particular family from a pre-reform house or apartment to later improved (or remodeled) dwelling—so that I would record and interpret both dwellings. My overall goal is to make detailed plan drawings identifying the material cultural “standards” of average middle-to-working class domestic environments in the late 19th and early 20th century. I focus on the transformation of house form and function (such as the addition of dining rooms, closets, private bedrooms) and domestic amenities and industrial produced goods & services (such as kitchen appliances, public utilities, etc.). Another way to describe the type of domestic history I am looking for is a history of working class family’s “firsts” and “lasts.” Or the first time a family used their own (three-fixture) bathroom, or ate in their own dining room, or put their clothes in a closet, or used an electric appliance like a washing-machine or a vacuum cleaner, or filled a shelf with books, or bought a piece of furniture that could be handed down---all for the first time. It’s also about the last time a family hand-pumped or hauled water, or used an outhouse, or cooked and heated on a wood or coal stove, or lived in a two or three room house or apartment, or shared bedrooms with parents and siblings, or took in boarders, or washed clothes by hand--all for the last time. Typically, however, many working class firsts and lasts overlap, as when new dining rooms are added to houses with old outhouses. This might be a way to publicize your family history but I would also appreciate any suggestions about previously documented sources or people who might be willing to contribute. I am also interested in literary sources, like Thomas Bell’s, _Out of This Furnace_ , where, for example, I have drawn the plan of described domestic scenes in a common type of Pittsburgh house—but this is a rare, accurately detailed account and I only show it as the type of detailed plan drawing I would like to make of other documented houses. Like the Charles and Ray Eames 1977 short film, Powers of Ten, Architectural Paint Research (APR) deals with magnitudes of scale, from a single pigment particle, to a painted house, to the decorative tastes of an entire region. In the spirit of the film, the 2017 APR conference aims to take a closer look at how we carry out our research at every level, from the micro to the macroscopic. 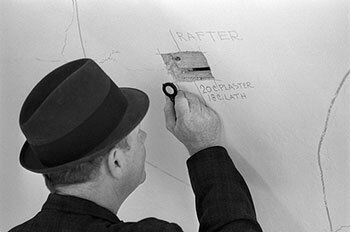 The 6th International Architectural Paint Research Conference organizing committee is sending out a call for papers and posters for its next meeting in New York City, March 15-17, 2017. Submissions are invited from APR specialists and advanced students, as well as members of related disciplines including art conservators, preservation architects, decorative painters, heritage managers and materials scientists. There will be a session on APR standards led by the standards committee, as put into motion at the 2014 Stockholm APR conference. Non-traditional or Overlooked Finishes: Projects where finishes identified through APR included unexpected color combinations, non-traditional use of traditional materials, finishes rarely discussed at previous APR conferences, or finishes that may be unique to a single geographic region. Case studies with a Focus on Cross-section Microscopy: As always, APR case studies are welcome topics at the conference. We request that papers be well supported by cross-section photomicrographs and other analytical data that illustrate your interpretive process. Research into paint materials and technologies: This can include archival research or research of a technical nature that sheds a new light on paint materials or finishes. Topics may focus on a particular studio or decorative painter/artist’s working methods, colourman’s practices, pigment manufacture, and/or the evolution of paint/pigment/varnish technology. Replication of Historic Finishes: Spotlight on the challenges and solutions involved with replicating finishes identified through APR. Topics can include methods for removing overpaint, collaborating with decorative painters to replicate schemes, and/or the sharing of information that could only have been gleaned through the preparation/replication process. Projects Revisited:Have you had the opportunity to re-visit an old project? If so, how have these projects fared over time? How has your work been received by the public? What lessons did you learn that carried over into future projects? The language of the conference will be English. To submit an abstract for a paper or poster, please submit a provisional title with a summary (500 word maximum) at http://www.apr2017.org/call-for-abstracts/. Please use the name of one author. The names of any co-authors can be submitted in the body of the abstract. This year we encourage submissions from advanced students working on APR related projects for a dedicated “Student Research Session”. Select papers will be included in the final publication. When submitting your abstract, please indicate if this is a student submission. Abstracts must be submitted by February 15, 2016. Selected speakers and poster authors will be notified by April 16, 2016. Details regarding guidelines for the conference presentations and articles will be provided at the time of notification. Speakers will also be requested to submit their work in the form of a full-text, illustrated article for publication in the conference post-prints. This article will be peer-reviewed and due on November 15, 2016. Poster authors may be asked to give a 5-minute presentation at the conference, but will not be responsible for an article. The AHLP is pleased to announce its 2016 annual meeting in Chicago, Illinois, and the Program Committee invites proposals for presentations that will encourage lively discussions about cultural landscapes. As Chicago emerged in the 1830s, “Urbs in Horto” became the newly formed city’s motto as well as its driving vision, as made apparent in the establishment of an extensive parks and boulevard system in the 1870s and Daniel Burnham’s 1909 Plan of Chicago, which called for the expansion of the system and the acquisition of natural areas outside the city limits. It is therefore a particularly appropriate setting to address cultural landscape preservation issues relating to urban parks and park planning; engaging with lakes and rivers; native plants and planting design; and “the middle west.” While presentations that address these topics are especially welcome, this should not discourage those wishing to address any issue relating to the theory and practice of landscape preservation. Because of time constraints, each person may submit only one proposal in the first two categories. Please submit an abstract of 500 words or less outlining the topic of the paper, its context within theory, practice, or education, its timeliness, principal findings or conclusions, and questions for discussion. Please submit a proposal of 250 words or less outlining the work-in-progress, its context and potential significance, and questions for discussion. Please submit a proposal of 250 words or less outlining the project, its context and significance, and questions for discussion. - relevance to the theme of the meeting. Those making a proposal will be notified of the decision of the panel by March 18, 2016. Presenters must pre-register for the meeting and must take out memberships in the Alliance if they are not already members. The Alliance will provide boards to which posters of the recommended size can be attached, but those presenting posters are responsible for the transportation of their posters to and from Chicago. The Alliance welcomes proposals from students and some scholarships are available for those whose proposals are accepted. Students wishing to apply for a scholarship should send their proposals together with their scholarship application materials to the AHLP Education Committee and not to Kimball Erdman. Please refer to the Alliance website for full scholarship application details. Questions arising from this call for papers and posters may be e-mailed to Kimball Erdman.